This was after the fifth plague: the Epidemic. "Whoever among the servants of Pharaoh feared the word of HASHEM chased his servants and his livestock to the houses. And whoever did not take the word of HASHEM to heart - he left his servants and livestock in the field." (Artscroll English Tanach). Now after the Torah said that all the livestock of Egypt died in the fifth plague, it showed that right before the sixth plague there was still some livestock who survived. Now I checked the Biblia Stuttgartensia, the word for livestock in 9:6 is "miqneh" and in 9:20-21 is "miqnehu" (his livestock). So is this a contradiction ? if not, how the Rabbis explained this contradiction ? Art Scroll commentaries deal with this question. In Va'eira 9:3 ArtScroll points out that 9:2 uses the phrase that are in the field implying that only the animals in the fields would be in danger. There are also some who say that it affected those types of animals that are normally kept in the fields and not those that are normally kept in the barns. Ramban and Rav Bachya point out several different possibilities exist. First, only the animals owned by the Egyptians died. Those owned by foreigners (or were sold to non-Egyptians before the plague) did not die. Note that it explicitly says that the animals owned by the Jews (including what they had bought before the plague) survived. After the plague, the Egyptians imported from outside their borders or bought animals from the Jews. One very reliable reference for the exegesis of Exodus is halakhic midrash from the school of Rabbi Akiva also known as the Mekhilta of Rabbi Shimon. (The word “Mekhilta” comes from the Aramaic word מכילתא, which means a collection of rules of interpretation, which is what we might today call Biblical Hermeneutics.) These midrashim first appeared during the Mishnaic Period of the Tannaim and Amoraim (First to the Third Centuries). 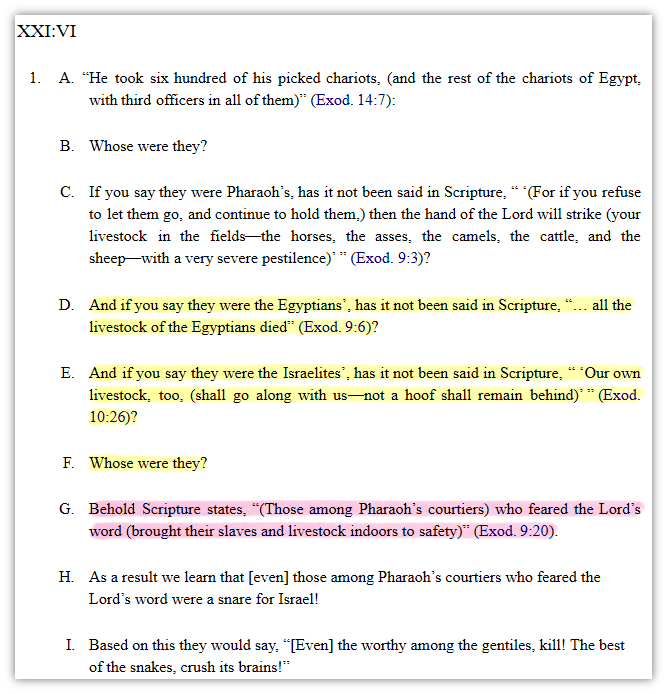 In tractate Beshallaḥ, Chapter 21, we read the following commentary concerning Exodus 9:6 - Please click on the image below in order to view the source online (i.e., Folio 17a, Line 1 in the middle of the page). In summary, while Egyptian livestock perished, it was the livestock of Egyptian cohorts employed by the Egyptians that survived. These surviving livestock were later employed to pursue the Jews when they fled Egypt. Ralbag says that when the posuk reads "all the livestock of Egypt died" that doesn't mean that "all of them" definetely perish, since the word כל does not mean more than the greater part of a whole. He brings several examples for that: As on the plague of the firtsborn, the Mitzrim exclaimed "we are all dead". The word "all" there (כלנו) does not mean "all mitzrim", but some of them. (See also Ibn Ezra on Shemos you quote, he says: רובו, meaning "most of it". Not the answer you're looking for? Browse other questions tagged parshanut-torah-comment animals commentaries va-eira shemot-exodus .